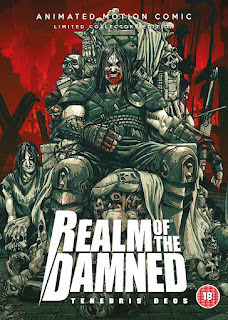 Heavy metal and graphic novel animation collide in REALM OF THE DAMNED - TENEBRIS DEOS. This animated motion comic was directed by Tom Paton who previously made the post-apocalyptic horror PANDORICA (2016). In a world full of supernatural beings the Vaticans last line of defence - The Congregation - has been over run. All heroes are gone except one, Alberich Van Helsing, a man who is probably no better then the monsters he hunts. Now those same monsters are hunting him, that is until an ancient evil awakens in Norway and Helsing is the only one that can perhaps stop it from ruling the world. His quest will see him battle vampires, werewolves, a mummy and a demi-god. If you are expecting amazing graphic animation seen in such horror anime as the HELLSING series, you will be disappointed as this is just pages of the novel of the same name being animated. Great voice work by Dani Filth (Cradle Of Filth), David Vincent (ex Morbid Angel) and Jill Janus (Huntress). 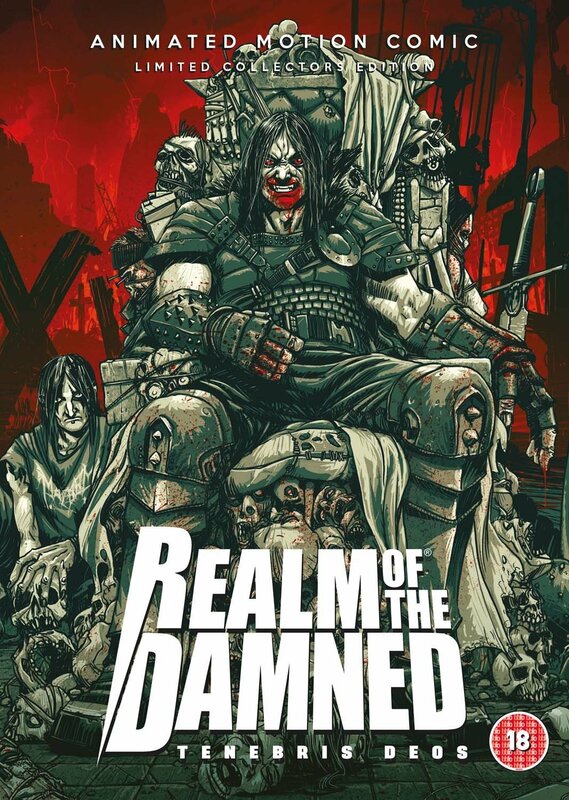 Highly recommend getting the album by Son's Of Balaur (Tenebris Deos) and the graphic novel of REALM OF THE DAMNED - TENEBRIS DEOS to fully immense yourself in this dark and graphic metal world. This is sure to be a hit with those who like their animation bloody. We are giving away 2 killer bundles of this movie and more. Head to the competition page to enter.